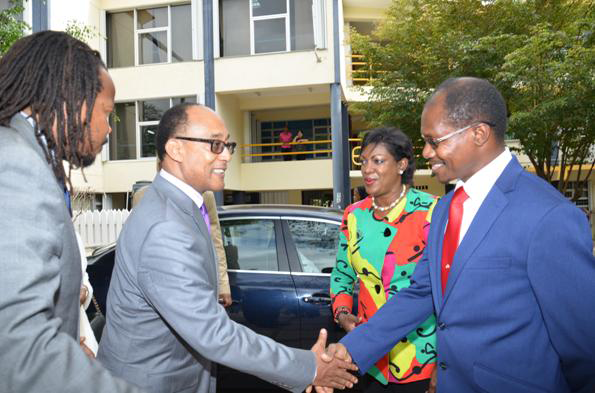 UTech, Jamaica Welcomes His Imperial Highness (HIH)Prince Ermias Sahle Selassie — UTech, Ja. Prof. Colin Gyles (right), Acting President, UTech, Jamaica welcomes His Imperial Highness (HIH) Prince Ermias Sahle Selassie on his arrival at the Caribbean Sculpture Park , Papine campus on Thursday, April 21, 2016. Mr. Steven Golding, member of the Commemoration Committee to mark the 50th Anniversary of the visit of Emperor Haile Selassie I to Jamaica presents the Prince. Looking on is Mrs. Jacqueline Knight-Campbell, Office of the President who organized the Prince’s visit to the University. The University of Technology, Jamaica (UTech, Ja.) was part of history yesterday, Thursday, April 21, 2016 as Acting President, Prof. Colin Gyles welcomed His Imperial Highness (HIH) Prince Ermias Sahle Selassie, grandson of the late Ethiopian Emperor Haile Salassie I, and his wife Princess Saba Kebede to the Papine campus. Arriving with fanfare at approximately 3:00 pm, at the Caribbean Sculpture Park accompanied by a ten-car motorcade, preceded by police outriders and the UTech, Jamaica Safety and Security motor vehicles, Prince Ermias Sahle Selassie and his entourage were welcomed by the pulsating rhythms of the UTech, Jamaica Drummers. The Prince was accompanied by Hon. Olivia “Babsy” Grange, CD, MP, Minister of Culture, Gender, Entertainment and Sport, Ambassador Elinor Felix, CD, JP, Chief of State Protocol in the Office of the Prime Minister, Chairman of the 50th anniversary Haile Selassie’s Visit Commemoration Committee, Dr. Michael Barnett, members of the Committee, Mr. Steven Golding and Mr. Marlon Stewart Gaynor, along with a large following of members of the Rastafarian community and the media. Prof. Gyles led the party on a brief tour of the Caribbean Sculpture Park, followed by a visit to the Centre for the Arts led by Director, Mr. Phillip Clarke, where Prince Sahle Selassie signed the official UTech, Jamaica Visitor’s book and was treated to an interlude of drumming by the inimitable UTech, Ja. Drummers who played a well-received medley, including, Rivers of Babylon and Mt. ZionI played to the Nyabingi rhythm. 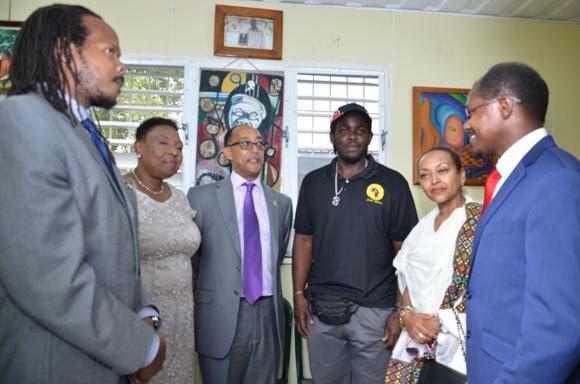 The royal visit ended with a tour of the student-based club - the African Cultural Renaissance Movement (ACRM) where an exhibition was mounted to welcome Prince Sahle Selassie, led by student President, Kevaughn Fraser. Mr. Benjamin Asamoah, Club Overseer and Advisor explained that the ACRM which has been in existence since 1971 at UTech, Jamaica is intended to promote African cultural awareness among students as well as to provide an evening school outreach programme that aids at risk youth in furthering their studies. Prof. Gyles bid farewell to Prince Sahle Selassie and his party at 3:45 pm where his visit to Jamaica continued to the UWI, Mona campus. His Imperial Highness arrived in the island on Thursday, April 21 for a nine-day visit in commemoration of the 50th anniversary of the state visit of his grandfather, the late Emperor of Ethiopia His Imperial Majesty (HIM). 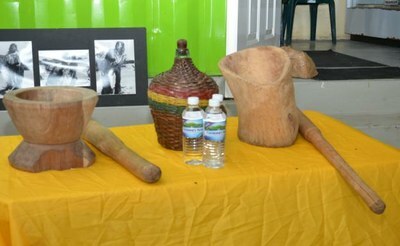 On his arrival at the Caribbean Sculpture Park, where he was welcomed by the UTech, Ja. 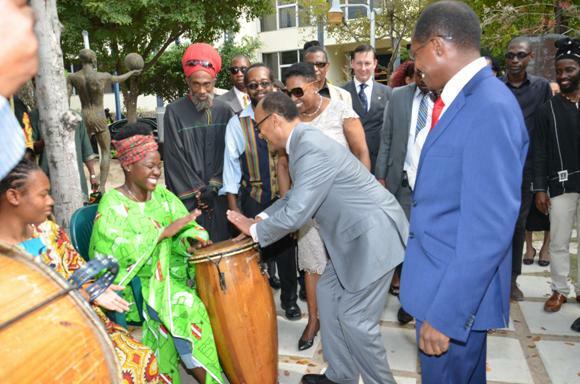 Drummers, Prince Ermias Haile Selassie immediately took a go at the drum much to the delight of UTech, Ja. 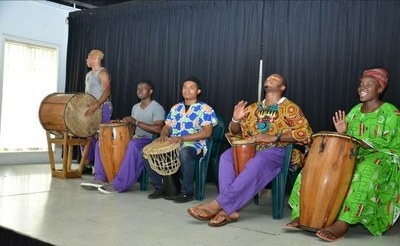 Centre for the Arts student drummer, Quickore Bennett (in green), Hon. Olivia Grange (3rd left), Minister of Culture, Gender, Entertainment and Sport, Prof. Colin Gyles (right) and others looking on. At right the Prince further thrills everyone as he takes over the playing of the accompanying tambourine. 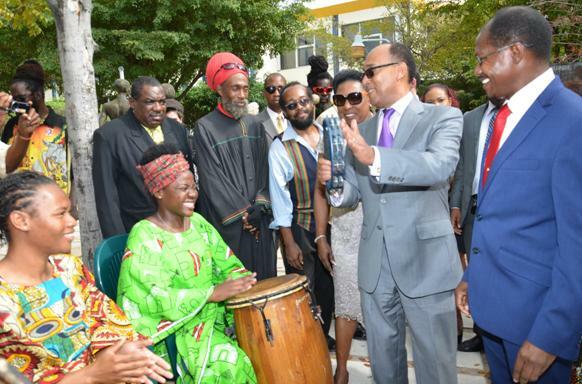 Prince Sahle Selassie and the visiting party enjoy the UTech, Jamaica drummers in performance. 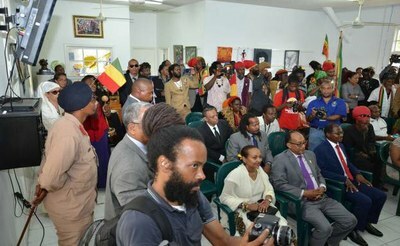 Kevaughn Fraser (4th left), President of the student-based African Cultural Renaissance Movement (ACRM) welcomes Prince Sahle Selassie (3rd left) and his wife Princess Saba Kebede (5th left), Mr. Steven Golding, Minister Grange and Prof. Colin Gyles to the ARCM building located on the UTech, Jamaica Papine campus. 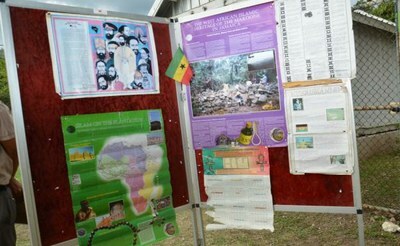 Pieces from the exhibition mounted by the ACRM.